In the Railway Budget 2013-14, one of the points made by Railways Minister was that, Railways will start offering ticket bookings via mobile phones. In last couple of days, few media outlets have reported that Indian Railways is quite close to offering a service that will enable passengers to do train ticket bookings via SMS. Infact, according to the WSJ report, this service will be launched as early as July 1st. However, there has been no official confirmation of any sort from Railways or IRCTC. We have tried to get in touch with few people knowhow whether this is actually true and waiting for confirmation from their side. If this news is true, then obviously there are lot of questions that will need answers – Simple reason being that ticket bookings will done through text messaging and not a normal online mobile app. Showing available seats to users, choosing destinations, dates, trains and travel classes, making payments etc. all these processes are going be quite tricky to achieve purely using text messaging without internet connectivity. According to WSJ, IRCTC will be making use of USSD or unstructured supplementary service data to achieve this. If you are not aware, USSD is a menu driven text messaging technology that communicated with a centralized server without being connected to the Internet. 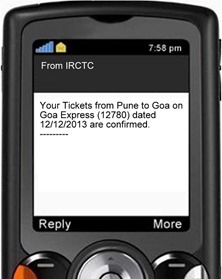 Rail Ticket Bookings through SMS is really a big deal. It suddenly opens up a platform to over 850 Indian mobile phone users to book tickets from most basic of phones. IRCTC, in recent times have been taking steps to upgrade and smoothen the process of booking tickets online. IRCTC plans to upgrade their server enabling support for 7200 bookings per minute up from existing 2000 bookings per minute. Few days back they also announced launch of SMS Based Passenger Complaint System. We hope that this news is true and we may soon see Railways Ticket Bookings done via SMS. However, given the track record of failures that IRCTC have had with their online portal, I just hope SMS ticket bookings don’t happen the same way. Gaana.com Launches Awesome SingAlong Karaoke App! Good initiative but let’s be honest, the IRCTC website needs more than a fair share of improvements; not just in the UI but the overall functioning and speed too. It needs a total overhaul.